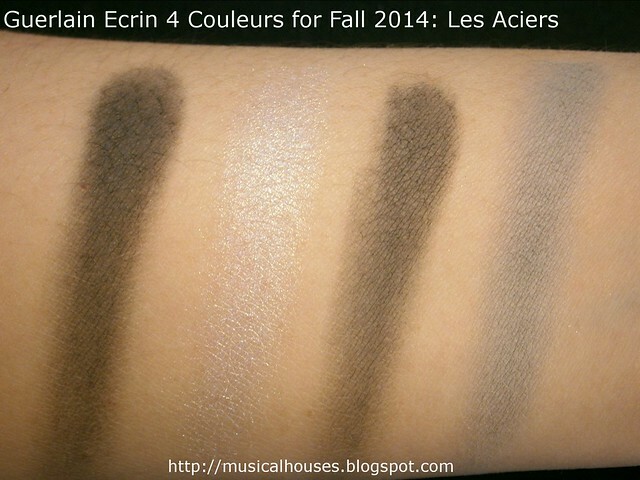 Guerlain's Kiss Kiss Collection for Fall 2014 consists of three new Ecrin 4 Couleurs eyeshadow palettes, and being the shameless swatcher that I am, I have swatched them for you! 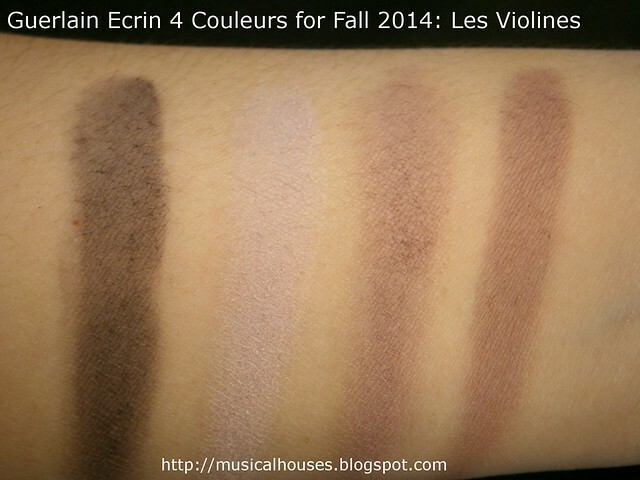 The Ecrin 4 Couleurs consists of Les Sables (browns and warm beiges), Les Violines (purple shades) and Les Aciers (smokey greys). Looks like the most popular looks - neutral and wearable, subtle colour, and deep smokey - have all been touched on for this Fall season! I know the swatches aren't perfect, but they were taken in indoor lighting in the evening at an event, which kind of messed up with the swatch colours. I've tried to edit the colours to make them look better, but this was the best I can do. First, Les Sables. This consists of a shimmery beige, a light warm peach/salmon shade, a light warm brown, and a deep neutral chocolate brown. 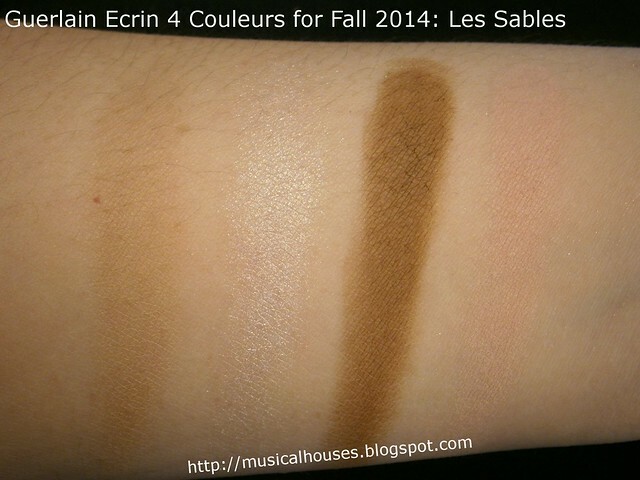 This is probably on the warm side, undertone-wise, but is neutral enough to suit most people. It's pretty light, though - I'm close to NC20 in MAC, and the two lightest shades seemed to blend in with my skin, so that's an indication of how light the shades are. I'm sure that this is probably going to be the most popular shade, especially in this part of the world. It's definitely my favourite this season. Next, Les Violines. If Les Sables was too boring for you and you wanted something darker, but you want something wearable with a bit of colour, Les Violines is a good choice. It consists of a light pastel lilac, a midtone violet lavender, a midtone warm plummy red-based purpoe, and a deep volet purple. The shades are primarily neutral or cool, with the exception of the red-based purple. When swatched, they all look quite neutral on me, though, so I imagine this would also be pretty universal on. This is my second favourite out of the lot! Love the first two! The greys I can pass on as I find grey shadow tricky to wear without looking ashy.